The Democrats cried foul over what they called foreign interference in 2016 election. Yet they support foreigners inferring in our 2018 elections. The Democrats have pulled up a dirty trick they used in the past – voter fraud. Tammany Hall, a Democrat organization in New York City, and Boss Tweed gave bribes to non-citizen Irish voters to vote multiple times back in the 19th century. Democrats have revived this dirty trick with a new twist. The California New Motor Voter Act entitles all who apply for a driver’s license be automatically registered to vote. It doesn’t matter if they are a citizen or not. The law requires the Department of Motor Vehicles to send all applicants to the Secretary of State’s Office for voter registration. This will make the United States the first nation in today’s world to allow non-citizens to vote potentially in national elections. It is foreign interference in our elections. Despite the Democrat howls of Russians interfering in the 2016 election they are making it possible for foreigners to interfere in our elections now. The California Democrat Party has also sent out voter registration ballots to illegal immigrants with the box marked citizen checked “Yes”. This type of voter fraud also occurred in Texas. The Texas Democrat Party is being investigated for voter fraud. They sent out voter-registration applications to non-citizens with the citizenship box already checked “Yes.” The possible violation was first raised Thursday by the Public Interest Legal Foundation(PILF) a nonprofit group specializing in election integrity. Texas Gov. Greg Abbott tweeted, “A complaint says the Texas Democratic Party asked non-citizens to register to vote, sending applications with citizenship box pre-checked. This is being investigated. If true there will be serious consequences,” Texas doesn’t fool around. An example is the case of Laura Janeth Garza a Mexican national. She was recently convicted of voter fraud and false voter impersonation. In this Texas case Garza was sentenced to 10 years in jail and a fine of $10,000. After her sentence is over she will be immediately deported. Garza pilfered identification documents from a legitimate US citizen in Fort Worth, Texas. She registered to vote in another part of the state. She voted in 2004, 2012 and 2016 before being caught. 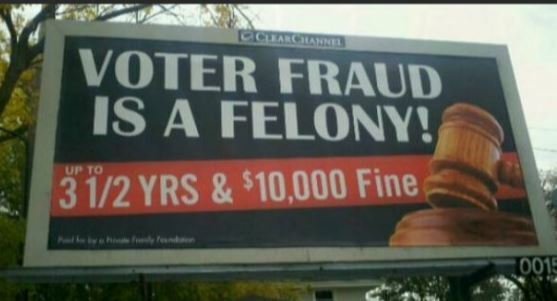 Texas is prosecuting additional illegal aliens for voter fraud. Another state investigation is North Carolina. The federal Justice Department has charged 19 aliens with illegal voting. The Immigration and Custom Enforcements (ICE) agency is charging aliens from numerous countries such as Mexico, the Dominican Republic, Nigeria and Germany with filing a false claim of citizenship in order to vote. This illegal activity is obviously part of a bigger plot. Georgia Democratic gubernatorial candidate Stacey Abrams in a video mentioned there will be a blue wave. “It is comprised of those who are documented and undocumented.” The call for undocumented illegal aliens to vote is a blatant disregard of US voting laws and is a felony. Any illegal alien who votes in violation of our voting laws risks a long prison term, heavy fine and deportation. Liberal Democrat states may not prosecute but other states and the federal government will. Any illegal alien who votes will eventually find themselves kicked out after prison. This entry was posted in Uncategorized and tagged California Democrat Part, California New Motor Voter Act, Democrats, federal felony, Garza Case, illegal aliens, Public Interest Legal Foundation, Tammany Hall, Texas Democrat Party, undocumented immigrants, voter fraud. Bookmark the permalink.